Mark Clementi and sons, William (left) and Cole. The family’s guitars are (from left) a Fender Squier Min held by William, Cole’s blueburst Rogue, a Gibson SC Southern Jumbo, Fender Lone Star American Stratocaster, a ’39 Gibson Jumbo 55, and Mark with his ’88 Martin HD28. Propped on the sofa are a ’79 Guild D-25, a Martin X series 000, and a ’68 Giannini 2/a. (LEFT) Here are Vincent Motel and his son, Andrew, jamming onstage. Vince is playing a Wilson Brothers VM75 while Andrew has a Vigier Excalibur. (RIGHT) Lee Helperin, with a 2003 Gibson Custom Shop reissue Les Paul with Brazilian fretboard, enjoys quality music time with sons Max (playing a 2013 LsL Topanga model) and Alex (playing a 2013 Eastwood Sidejack Baritone DLX). The picture was taken by Lee’s wife (and the boys’ mom), Judy, on a Mother’s Day in Ontario. 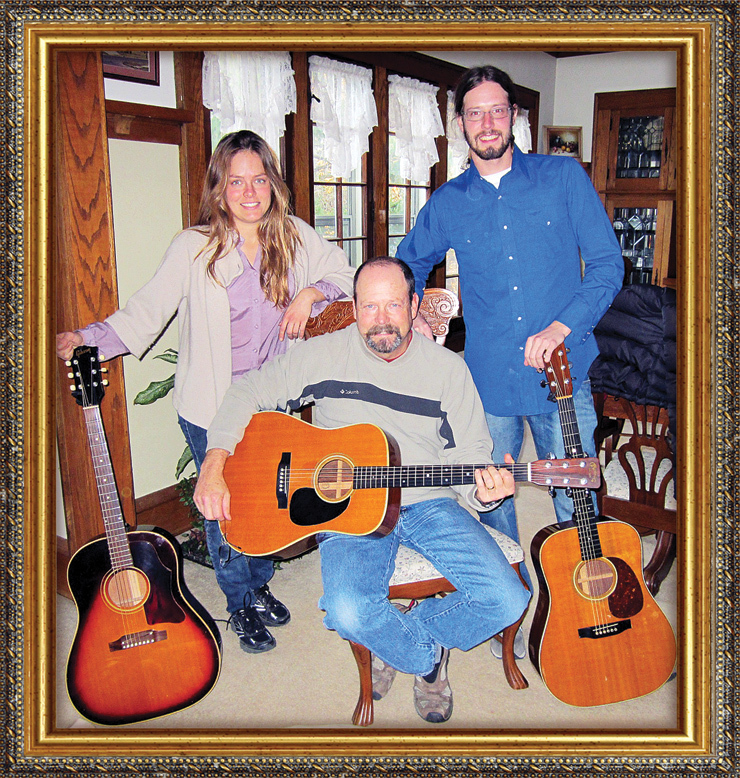 Here are Christy and David Hays with their father, Steve, and a few of the family’s guitars – a ’63 Gibson J-45, ’66 Martin D-28, and and early-’70s Martin HD-28. 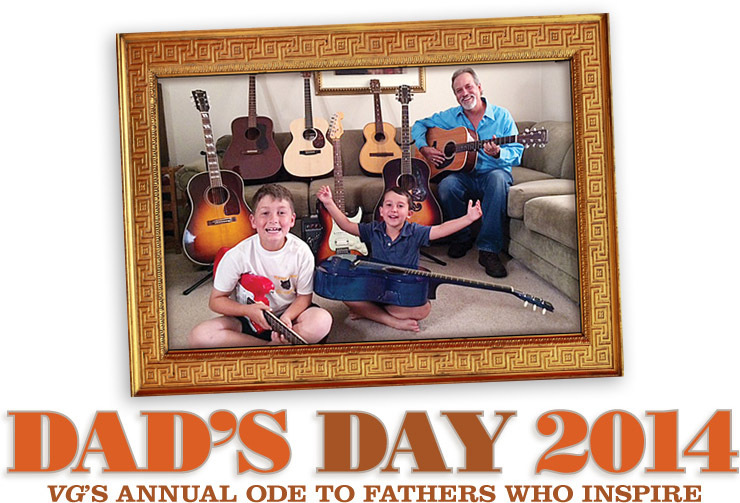 “Dad has been [very] influential touting the coolness of music and old guitars in our lives,” Christy told us. “We grew up with a basement full of vintage guitars and amps, and some of my earliest memories are of the smell of the inside of a Les Paul case. When I was 14, dad gave me his ’62 Gibson B-25; I am now a professional songwriter and it’s still my preferred axe. My brother is an avid flatpicker and received his first Martin as a gift from my father when he graduated high school. 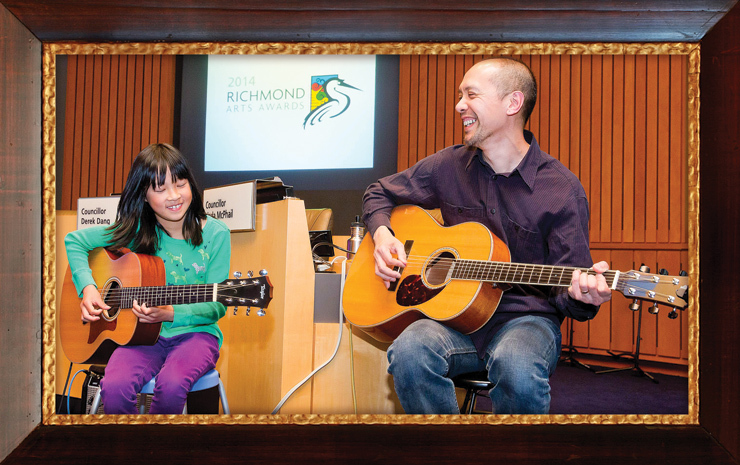 “Mom and dad have fostered creativity, self-expression, and a deep appreciation for the joy music brings to our lives. I’d come home from school, dad would return from work shortly after and, with his Marshall stack in the basement, rattle the leaded glass three floors up! “Dad is a working man. He worked as a welder and slowly amassed his collection throughout life. He is not a wealthy man who collects because of nostalgia; his collection is built on a foundation of deep admiration and love of the instrument and all of its incarnations. And, the stacks upon stacks of Vintage Guitar magazines that have been coming to my parents house for 20-plus years are a testament to his love of the vintage-guitar culture. (LEFT) D.L. Peterson and his daughter, Scout, are avid readers (or, in Scout’s case, avid picture viewer) of VG. 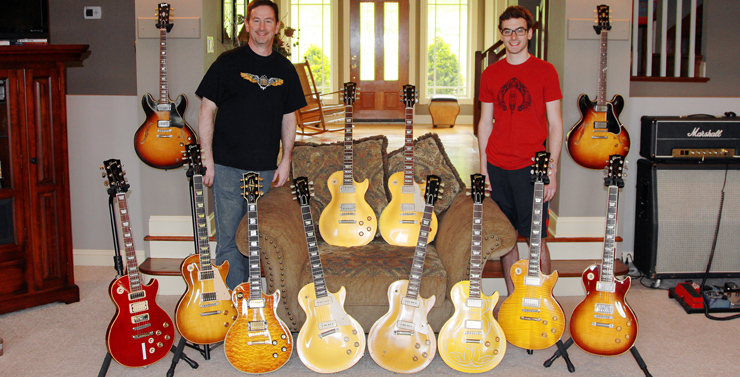 Here they are with D.L.’s “other baby,” his all-original ’53 Gibson Les Paul. (RIGHT) Ryan McCaffrey’s four-year-old son, Beckett, with his first “real” guitar, “Rocking out some Clapton,” his dad says with a chuckle. 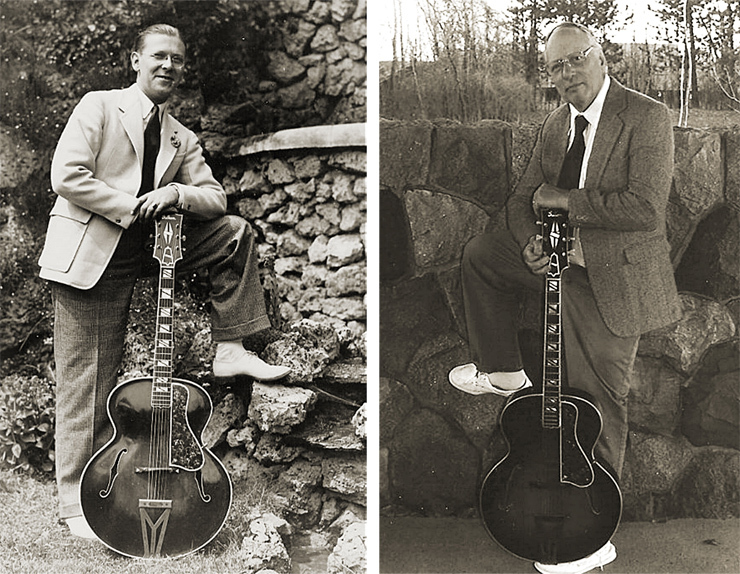 (LEFT) Todd Rooker sent this shot of his dad, Dale, when he was 16 and obviously proud of his new ’61 Gibson ES-125TC. “He still has it, and it’s in amazingly good condition,” Todd said. 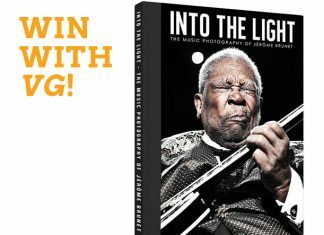 “He has spawned two more generations of Rooker guitar players, as both my 14-year-old son, Nicholas, and I have picked up playing and building guitars. Dad lives 1,800 miles away, but we still get together a couple times a year and play as a family.” (RIGHT) The McLaughlin family sent this shot, starring Erin (left) with her Fender Telecaster in Pink Paisley, dad (Andy) with a Fender Custom Shop ’55 Telecaster, and Ian with his Gibson Les Paul. Here are Dominic Harris and his son, Keith Richard Harris, who is named for his dad’s favorite Rolling Stone… even if Keith’s favorite band is currently The Beatles. (LEFT) Here are Dusty Murphy and his eight-year-old son, Poncho, with their acoustics. 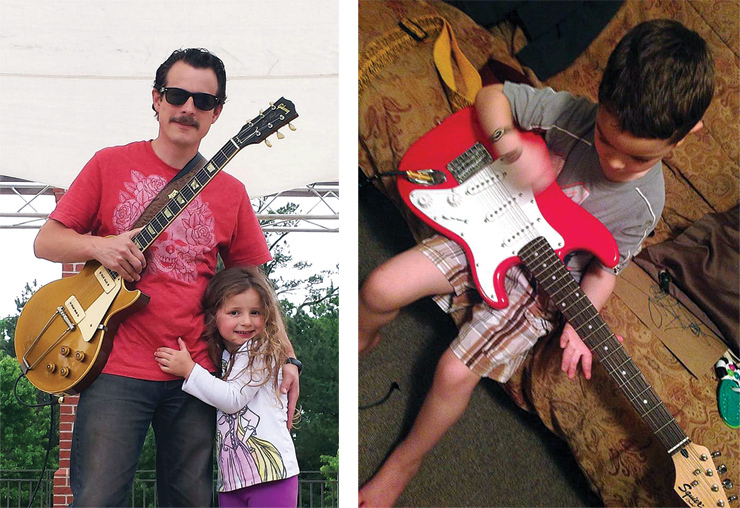 (RIGHT) Karl Maurer sent this pic and says, “In spite of many medical challenges, my 11-year-old son, Dom, loves to play blues and rock guitar with a bit of his dad’s help.” Karl keeps the top neck on his Epiphone ES-1275 tuned to open G. “Being Dom’s dad rocks!” he adds. 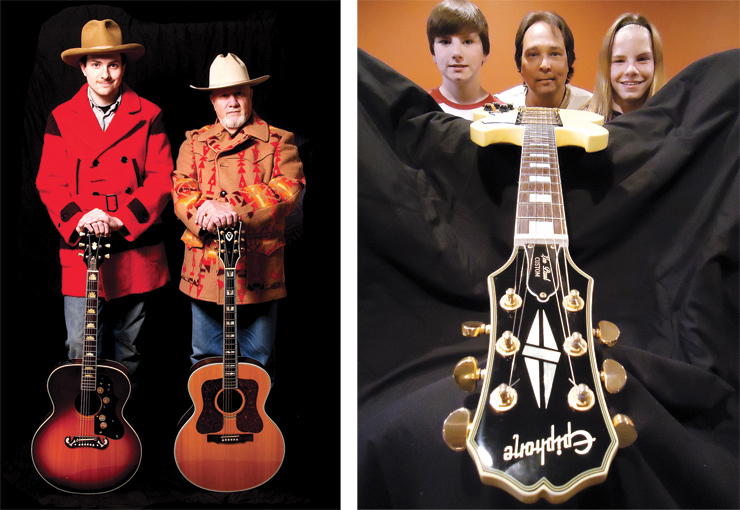 Art Martinez (center) enjoys sharing the love of music with his twin boys, Blake (left, with Taylor 410ce) and Taylor (right, with Taylor 655ce). Art, who has a Taylor K10ce here, also loves playing his Fender and Epiphone guitars, mandolins, and basses. His wife, Donna, and their boys are also members of their church worship team. 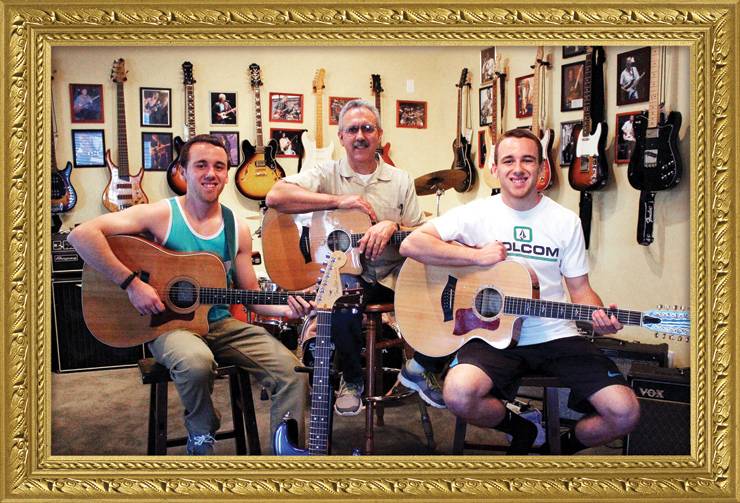 (LEFT) The Riech family – brothers David (left), Craig, and Michael, with their father (center, at mic) a few years ago when they visited the Fender factory/service center in California. “Craig and I would play there every Sunday, and dad and David would both come to watch and occasionally sit in,” Michael said. “Dad is holding Craig’s Taylor. He also had an early-’60s ES-330, which I still have. Dad and David have since passed, and I have fond memories of our Sunday jams.” (RIGHT) The McLaughlin family sent this shot, starring Erin (left) with her Fender Telecaster in Pink Paisley, dad (Andy) with a Fender Custom Shop ’55 Telecaster, and Ian with his Gibson Les Paul. (LEFT) Doc and Daniel Simons‘ collection includes (from left) a Blueridge BR-343 Gospel Trinity, a “partscaster,” a ’68 “drip-edge” Super Reverb, Squier Mustang bass, ’66 Vibrolux Reverb in Red Sparkle Mojotone Cab, Epiphone ES-339 PRO, ’90s Gibson Nighthawk Standard with factory Floyd Rose, Gibson Western Classic 200 reissue, ’54 Guild X-350, ’94 Nighthawk Custom, a Deluxe 5E3 clone, Fender FM-61SE electric mandolin, two Strad-O-Lin mandos,a ’65 Deluxe Reverb, a parts Tele, a guitar they call the “Frankencaster” (with P-90s), and Epiphone resonator they call The Biscuit, and a Blueridge BR-160. (RIGHT) Shawn Cyr and his son, Connor, enjoy rockin’ together. 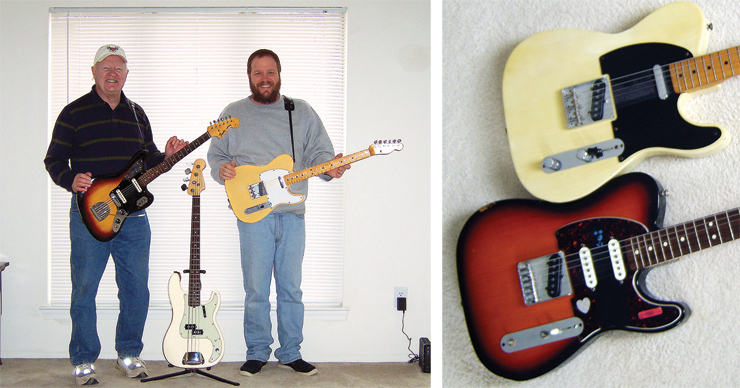 Here’s Shawn with his ’62 Fender Esquire and ’54 Deluxe, while Connor employs the family’s ’72 Gibson Les Paul Custom and ’72 Deluxe Reverb. (LEFT) Stan Adamczyk sent this shot of himself and his sons. That’s Ivan “The Butcher” on a redburst Hagstrom, Adam “Catfish Crazy” on six-string Carvin bass, with “Guitar Man” Stan on black Les Paul. (RIGHT) Todd Burrell sent this shot of his dad (Lefty), mom, and Uncle Skinny – The Family Band – jamming.